Also known as Powder actuated fastener tool. 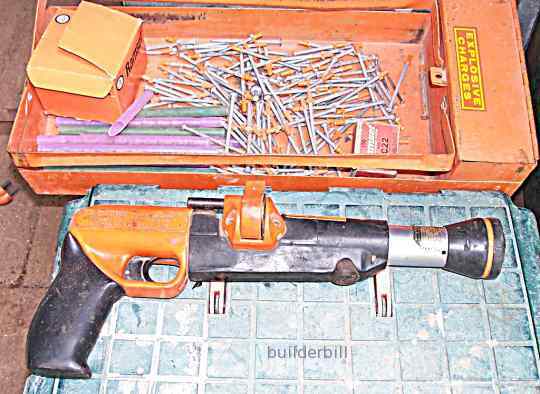 A "gun" that can fire high tensile steel nails and bolt fittings into hard materials like steel of concrete. Sometimes called direct fasteners. 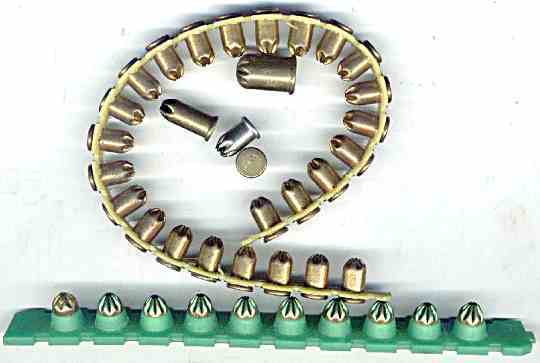 A small box of charges can be seen, (with C22 on the top) that are .22 calibre explosives, referred to as "charges" that are loaded singly each time this particular gun is used. The coloured straws in the tray contain cartridges that are loaded singly with the manual action of the breech. The cartridges are colour coded for the various strengths. In the tray are also 75 mm hardened steel nails. The heads are 8 mm and the points of the fasteners have plastic spacers (also 8 mm) to hold the fastener central in the bore. The position of the nail is just under the cartridge for maximum power, however pushing the nail farther down the barrel reduces the effectiveness of the change so this can also be used to control the depth of penetration. The explosive fastener tool above saw much of it's service on concrete formwork jobs. Shooting down sole plates and kickers to stop braces moving. This meant that when the concrete was poured then the nailed pieces had to be removed. Mostly the timber would come off leaving the nail solid in the concrete. Removing these high tensile nails should be done with care. The usual method is to whack them backwards and forwards with a hammer a few times and as they are brittle they snap off. Always wear eye protection when doing this and keep your eyes open for passers by as these things when they snap can fly off at high speed. Other uses of these tools are permanent fixing of members directly to steel, concrete or masonry. Nails can be short, long, with different heads and with threaded ends for fixing items such as cable trays and suspended ceiling fittings with nuts and washer. The nails can also be fired though washers to increase the head size. They must of course only be used by licensed operators and all safety measures must be complied with.